Tomorrow i will be Releasing the Brand new Pride and Joy. 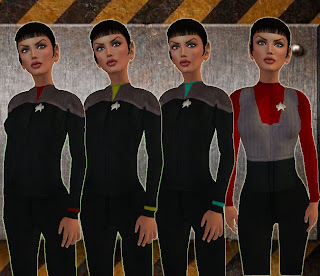 Over the last couple weeks i have been working really hard on remaking TOS, TNG, VOY and a few STO's... Tomorrow I am Releasing a Uniform Set that I am VERY Proud of. I've been working really hard on it and I am hoping The Star trek community will receive it well... My Latest pride and Joy ... Mollsens Brand New DS9 Collection ... here is a sneek peek of what they look like.